Malignant Records are such label that often (actually: most of the time) come up with something that deeply inspires and surprises. Actually, I have not ever been disappointed by any release, though I have, since I am a human being (or at least I am trying to act like one, from time to time), my preferred ones, and that means some lesser releases in my personal opinion, for what it’s worth. But hey, that has to do with subjectivity, something man cannot escape from, of course. Anyway, the label usually comes up with excellent, sometimes even unique stuff within genres like Death Industrial, Drone-Noise, Power Electronics and the likes. But within their open-minded vision on the darkest aspects of the aural spectrum, Malignant Records offers its audience some ritualistic ambience too, from time to time. Such a surprising release is this one: MA RT YR IA by Greek duo Martyria. It’s a project that consists of George Zafiriadis (vocals, didgeridoo, synths, Ozark harp) and Lena Merkouri (vocals, percussions and wind instruments), adding yin and yang, male and female, night and day, the opposite things that search for equilibrium. It’s like a forty-minutes sonic ritual which signifies ‘the arrival of a vital new entry into the world of Ritual / Dark Ambience’. The album comes in a six-panel digipack format, which is a visualisation (and sonic expression) of the duo’s eschatological concept. As from 2015, Lena and George are like focusing on the primal aspects of man’s mental / psychic state of mind, its origin and nature, and its destiny. With this album, Martyria try to achieve ‘the right atmosphere which will help […] to explore our inner world’ by processing spiritual / ritual knowledge and consciousness. ‘Darkness is the power of the most intense feelings a person can experience’, and then we’re referring to the manifestation of melancholy and pain, loss and loneliness, mental emptiness and depression, and the inner-emotional craving for death. Though a mystic, mythic, mysterious and even mythologically inspired way (hey, they are from Greece, as said…), they channel their ceremonies into five different, transcendental rituals. 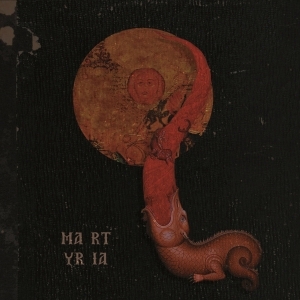 The Martyria album has a lot to offer, though it does need some listens before getting the whole. It is an abundant, sumptuous but defiant challenge for man’s senses, twisted / twisting at the one hand, meditative at the other. A great debut by a young duo, and highly recommended!